Previous post: why did my cookies spread? People, I’m about at the end of my ordered-in dinner rope. It’s not that — as the front page of this site might suggest — I haven’t cooked anything since the baby arrived, it’s just that I’ve largely cooked things that could be assembled during naptimes, and most of Alex and my conversations about meals go, “What should we do for dinner?” “I made mushroom toasts and a bowl of butterscotch sauce today!” “Right, so what should we order?” And so on with the pho, cracker-thin pizza and hummusiot dinner deliveries. For three months. At 93 days, even shakshuka broiled with haloumi gets tiresome. Now, I don’t expect any violins, especially from folks without the East Village’s globe of food delivery options at their fingertips, but I am sure you all understand what it means to desperately crave a homecooked meal. And I don’t mean a 5-hour braise or hand-sheeted pasta (though, ahem, I wouldn’t push either away); even a simple sautéed chicken, which I managed to eek out a few weeks ago, stands out as one of the best things we’ve eaten in a month. Now I wouldn’t call what I made for dinner Thursday night me turning over a new leaf, one in which eating dinner won’t involve bickering over politely discussing whose turn it is to pick up the phone while the other one changes the tot into his frog pajamas, and certainly not during a week better devoted to cookie-baking, gift-packaging and being a guest at someone else’s table, but I’d like to think it’s a start. A homey, delicious start, and one I can’t wait to see more of in the new year. So what’s the story with this? A lifetime ago, I told you about Alex’s Chicken and Mushroom Marsala, which I said, frankly, was all about the mushrooms while the chicken lingered in the background like a b-list celebrity. So when I saw Giada making a pasta dish that forewent the chicken to just hone in on the marsala mushrooms — and even threw in artichokes, my favorite-est vegetable — it was enough to even get this discombobulated cook organized in time for dinner. The only note I’d make about the flavor is that, though I enjoyed the subtle meatiness of the dish, I can see why others might want a little acid to brighten it up; if you find this to be the case, I think a tablespoon or so of lemon juice or a splash of balsamic added at the end might do the trick. Place the olive oil in a large, heavy skillet over medium-high heat. Add the onions and cook for one minute. Add the mushrooms and one teaspoon of the salt. Sauté, stirring occasionally, until all the moisture has evaporated and the mushrooms have cooked down, about 10 minutes (though this took me much less time). Add the Marsala and continue cooking until almost all the wine has evaporated, about 5 minutes. Meanwhile, bring a large pot of water to a boil over high heat. Stir in remaining salt. Add the pasta and cook until tender but still firm to the bite, stirring occasionally, about 8 to 10 minutes. Drain pasta and add it into the mushrooms, Marsala and onions Add the artichoke hearts, Parmesan and cream and cook until the artichokes are heated through, about 5 minutes. Stir in the parsley and pepper, then adjust seasonings to taste. Transfer to a serving bowl and serve. Update 12/30/13: I hadn’t made this and years and dusted it off tonight. Conclusion: I think I’d actually like this better with twice as many mushroom and no artichokes. I mentioned above that I thought it needed some lemon or acidity — actually, artichokes do. Mushrooms and marsala sauce are perfect together, after all. I’d rather save the artichokes for a more lemony pasta sauce. why did my cookies spread? I LOVE the pasta you used. Any marsala dish is my fave. This sounds marvelous. I have loved all your posts even though they were not meals. I do love pasta. It is so versatile! Yours sounds delicious! That looks excellent and might be the perfect Christmas Eve Dinner. The shakshuka broiled with haloumi sounds pretty tasty as well! Artichokes is something i’m so curious about! I’ve had the bottled on with tiny pieces stingily sprinkled on a pizza but I don’t what fresh might taste like… Someday they will make their way across the “globe”. ooh, I wish I had the ingredients to make this right now. Sadly though, we’re snowed in today in Baltimore, so it will have to wait until I can make it back to the store! Hope you guys take Jacob out to get some pictures of him in the snow today! Mushrooms and artichokes are my favorite! Sadly, I hadn’t thought to put them together off a pizza. This will definitely appear at my house soon. This looks delicious Deb. I needed something to make for a casual vegetarian dinner with friends tomorrow so it looks like I’m going to be out to the store for some artichokes later! this looks fantastic, like my ideal pasta. i’ll have to remember this next time the husband isn’t home, as he is anti- mushrooms AND artichokes. Mmm…where was this yesterday in my presnow prep? Something to look forward to apres-snow. Thank you for this–I love marsala but didn’t envision a non-meat alternative! Um. The pasta looks good too. She said sheepishly. This looks comforting and fabulous! OH, this makes me sooooo mad! I have NEVER been able to find frozen artichoke hearts where we live…. I have at least 10 recipes that call for those, and now this one will be joining that folder. I think I’m going to serve this as a side dish to Ina’s Indonesian chicken, which I just adore. I can’t get enough of mushrooms these days. Carbs and fungus … mmmm (seriously). I can’t wait to try this…loved chicken marsala as a girl but have missed the flavor since turning vegetarian. thanks! This looks delish! Hang in there Deb – that first year I felt like I was constantly “in the weeds”. I learned to love my crockpot…we ate “salsa chicken tacos” at least once a week (chk breasts, jar of frsh salsa, 1/2 cup honey in slow cooker all day til it’s super shredded-yum!!) fill it up during naptime and then no fuss…keep up the good work – sounds like you are doing a fab job!! Although I’m not in love with all of the contents of this dish, it looks so good that I might have try it anyway. this is perfect deb. i can’t wait to try it. i’ve been traveling the past two weeks for work and was just pondering what simple homey dish i could make for the husband tonight. i agree with the favoriteness of the artichokes. That sounds so delicious! I have actually been really into mushrooms lately and just realized I forgot to buy them last night. Now, I am snowed in and can’t go get any. As a cooking teacher, personal chef, food writer, and blogger, I find I’m cooking (and photographing food) ALL the time, but when it comes time for our own dinner, I’m cooked out for the day. Not living in NY, we tend to eat out as opposed to order in, but same thing – there comes a time when you crave a good home cooked meal! I finally got to it last night with a roasted whole stuffed rainbow trout (from a local trout farm in CO no less) and a great holiday tosted rice. Hit the spot! Oh this sounds delightful! Frozen artichokes? I had no idea there was such a thing! I’m 99% sure I can’t get frozen artichokes in any grocery store I frequent. Is there an alternative? Could I use canned or jarred artichokes instead? Awww, he’s 93 days old?! I am so in love with your baby. Not in a creepy way. But he is seriously adorable. And the food looks good, too. I know what you mean about needing a home-cooked meal after a while, no matter how yummy the takeout options are. Deb, I can never find frozen artichokes in NYC–I’ve tried whole foods, other organic groceries and even the Park Slope Food Coop with no luck. I had given it up as a west coast thing. Do you have a solution? Meghan — I was actually really impressed with the quality of frozen artichokes from Trader Joes, though I confess mine have been in the depths of my freezer for months, I mean weeks, uh, pinky swear! This is my go to quick meal for my family. It is easy and delicous. In a pinch I’ve used marinated artichokes and they aren’t a bad substitute. Yum. I’ve enjoyed making all of your recipes. thanks. I swoon for anything with artichoke hearts in them! I am able to find frozen ones at our Trader Joe’s. Thanks for the great sounding recipe. Will try it very soon. just came in from whole foods…& other markets to hunker down for the impending snow blanketing our area (& yours)…& sk cooking & sk baking…& i want to say that i love your site, your recipes are sublime, you put a smile on my face & brighten my day…truly…& i thank you!! deb, you have done an incredible job with your “recipe index” & cookie guide, gift packaging suggestions etc….what can i say other than the tot in the frog jammies is truly adorable & lucky to have you as his mom! Meghan–I’ve gotten frozen artichokes at Whole Foods, but not consistently; it’s hit or miss. This looks just beautiful – but I too can’t find frozen artichoke hearts – what do you think would be a good replacement? That sounds delicious! I have that same pasta in my cupboard, I’m excited to try it out! hey deb that sounds delicious!!! though we dont use alcohol of any sort…so ermm…any idea on what i could substitue foe the marsala? Would Port work as a substitute for Marsala – if not, is there a sub you would suggest? Kate — Port might be a little sweet. This site has some suggested substitutions. Did you see that your website was mentioned in O magazine?? I was so excited to be ahead of the trend since I have been reading for long time!! Congratulations.. Hang in there, Deb… it gets better soon! My daughter is 7months old and I’ve only recently been able to bake and cook away like I did before baby… what a liberating feeling! I was getting tired of feeling so unable to cook anything that required more than 15 mins of work, though all the moments with her were more than worth it. Plus, since we no longer live in NYC (small town waaay upstate now), our take-out options are beyond sad. But, yes… it gets better! Wait until he can sit in the high chair and watch you cook while playing. Even better… wait until you can cook HIM food! Making babyfood has been the most fun so far!! Oh goodness, I now wish I wasn’t going out to eat tonight. I want to make this right now! Oh and I have some Marsala wine that needs to be used up even! I love mushrooms and artichokes. I serve fresh artichokes to my children whenever I find the baby ones that are so tender that they almost melt in your mouth. Perfect for their little hands as well. I’ll definitively try your recipe soon. This looks wonderful! Do you think that Portobellas would work in this? Maybe scraping out the gills would work. The bf has been asking for chicken marsala for days, I may have to make this tonight. Thank you! That brand of pasta that you used is MY FAVORITE! 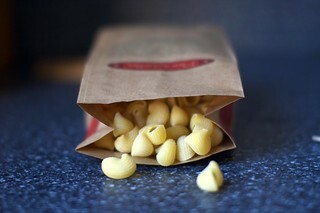 It’s hard to find a good, quality dried pasta (while you’re waiting for someone to make you the fresh stuff :-) ). This looks delicious, can’t wait to try it. Oh and Pioneer Womans new cookbook was on the Today show this morning! Let Meghan know that she can also find them at the Park Slope Food Coop. Open the second door from the left, it is shelved about midway down. They are sometimes hard to see if there are only a few packages. (I just bought them yesterday). And, you will also be able to find them at the Bay Ridge Food Co-op when it opens. Yum! For some reason, this reminds me of your mushroom stroganoff which I absolutely love – I often add canned artichokes to the dish when I make it because I have never been able to find frozen artichokes. 90 days is about when a semblance of “normal” happened with our first baby, too, so you’re right on track! Adding this to the Christmas menu! I’m sitting here waiting for my husband to come home. I’m snaking on saltines in an effort to quell the knawing hunger in my belly and this post is just not helping. Oh my – he’s huge and so adorable!! Your recipes and your humorous writing style keep me coming back consistently. But I have to compliment you big-time on your photos. They are done so professionally, with your artful compostions and occasional shallow depth of field. I have to pause and consider, sometimes, that you are actually taking a photo with one hand while doing something in the shot with the other. In the lower righthand quadrant above, it looks like you are pouring the marsala into the mushroom/onion mixture, no? Is that all YOU, or did hubby help accomplish that? Thanks! I was holding the camera with my right hand. It’s not the brightest thing I do but there isn’t enough room for me and the tripod to share space in the kitchen. it gets easier luckily… after my kidlet was born i was back to cooking every night my first night home, i’ve relyed a lot on things like the carseat, vibrating chairs and exerscaucers to cook dinner. High chairs so that they can watch come in really handy too, and when he’s older you can give him bits and pieces to munch on and play with while you cook! I am crazy for mushrooms! Don’t care too much for artichokes, though, but if I make this for my fiance, I’ll leave them in and give them another try. Do you ever find that are foods you really wish you liked? Like olives… I want to like them, I really do, I love capers which are in the same flavor family, but they just make me want to throw up a little. This looks delicious! I LOVE LOVE LOVE mushrooms! Lady,I swear, if you put it up on the website, I can’t help but cook it! Who can resist those pictures? Besides, you have a knack for picking down to earth delicious recipes…and I appreciate all the vegetarian dishes! So long as it has butter, cheese, and wine, who needs beef? Really-thank you for such a beautiful, dependable blog! YUM! Yumm…. I can hardly wait to try this recipe it looks wonderful. The fact that you can cook, care for baby AND take pictures is amazing. This sounds great. A nice vegetarian meal in amongst the meat-heavy holiday party meals. And, WOW, I just read about you in Oprah magazine. That’s cool! I love arthichokes and mushrooms- but never really thought about throwing them together with pasta via marsala style. This is definately on my list of things to make this week. I LOVE your photos as well- they make me want to cook everything you post on here. Thanks for posting such wonderful recipes/pictures! I will be making this soon. No snow in ATL. I am allergic to tomatoes so pasta without them is rare. I happen to have 10 fresh baby artichokes that would be perfect for this. Plenty of mushrooms too. No alcohol; beef stock will be used with some heavy cream. I love to use unusual shapes of dried pasta too. Cooking for one is not easy with pasta, but it freezes well. I freeze it in 1 cup cooked portions, then add sauce after it thaws. Can’t go wrong with artichokes. Looks like a meal I need to make. Thanks. This will be perfect for me to make when my husband is out of town. He hates mushrooms, but mushrooms and artichokes are two of my favorite things. Thanks for sharing. I have a question, I hope anyone can help..I have been trying recipes from various sites, and when a site calls for wine, I am clueless! I tried a recipe that said dry white wine…well, l go to the store and there are tons of white wine..which to use, I used a chardonnay??? I would love to make this dish but now I have seen a few marsalas, which is dry?? How come people can’t just tell us which brand of wine?? Would make it easy on us wine dummies!! Thanks for letting me rant this morning! and thanks for any help or guidence! You had me at Marsala. Really. I could drink that stuff on my morning cereal. After years of cooking 6 hour meaty sauces, I do enjoy a pasta dish that doesn’t require any meat…or hours of cooking time! Love this: mushrooms, marsala, pasta, parmesan. Beautiful. A splash of lemon juice should be just right: I put about that much in mushrooms smetana, and it’s perfect. I’d forego the frozen artichokes, though: I’ve never known them to be anything other than flabby and flavorless. Port would be seriously too sweet for this, and since it’s also a fortified wine, that won’t solve the alcohol problem. I almost think you’d be better off with (big laughs) prune juice there, maybe lightened a little with a spoonful or two of water. Or maybe pomegranate molasses, thinned down, but I’d have to mess with it a bit. Hi – Love the web-site. Just recently found it and really enjoy the recipes. This dish looks wonderful. Like in so many other comments, I have never found frozen artichokes. And I have seen them listed in other recipes. That’s the problem with living in a rather small town. PS: I just adore your site!! Happiest of holidays to you and your family! Thank you for reading my mind. Just returned from our indoor farmers’ market with fresh mushrooms and artichokes and headed right here to my favorite recipe site to see what wonderful ideas you have for using them. Voila! Sounds delish! I also bought fresh red and green kale. Hope you’ll post some yummy ideas for that winter staple someday. I don’t know Amy, but I totally agree–this would be wonderful for a Christmas Eve dinner … and I think that’s just want I’ll be cooking. oh my, this sounds just up my street. must try soon. Although neither my husband and I are big fans of mushrooms, let me just take this moment to express my jealousy of your All-clad pot. The end. I made this last night, thanks for the great idea. It was delicious, and my kids loved it, so I’ll be making it again. Good thing Marsala wine doesn’t go bad. My only complaint? No pictures of the baby! There are always baby pictures. I just made this for Sunday dinner – it’s so lovely to find delicious vegetarian recipes for my fiance! Thank you for writing such a beautiful, inspiring and delicious blog – it’s one of my favorites! I never know how to jazz up pasta. The wine and cream sauce sounds delish. I will have to try this because my sweetie loves mushrooms. On a completely different note – I discovered your cookie recipe for David Leite’s consummate chocolate chip cookie (love, love, love your blog). I’m testing the different stages of the rested dough method by baking mini batches every 12 hours for 48 hours. So far they keep getting even more mouth-watering – in fact, they are so good that I can’t stop eating them. I told myself that I’m signing up for a marathon after this experiment. do frog pajamas come available in adult sizes? I’m amazed you’re cooking at all! Our baby just turned one, and I feel as if our home has settled enough that I get some bigger chunks of time to myself. I made this when I had my old blog (with its sad, grainy pictures and poor lighting, so I won’t embarrass myself with a link right now). I used farfalle, as it’s what I had on hand. I. LOVE. THIS. DISH. Oh man. And I’m still learning to like mushrooms! This dish is THAT good. For anyone who can’t get a particular ingredient at their local store: grocery store managers are usually happy to order things for you, and if they get enough requests they might start to stock that item on a regular basis. We need to band together to get better ingredients stocked in more stores! Have you had the Shakshuka (let a lone the Hummus) at Hummus Place? To Die For. Seriously. I think this might end up being dinner tonight (umm, if I can figure out what to do with the half dozen ingredients that I don’t have on hand). Heh. I’m going to the grocery store on the way home anyway! At your urging I baked World Peace cookies this weekend to general acclaim, so let me return the favor. Turn your back on the Gourmet salted caramel recipe and try the one from December’s Food and Wine (available on the website). Made it this weekend and it was the salted caramel one dreams of. Enjoy! I make mushroom marsala sauce b/c that’s always been my favorite part of chicken marsala. I never thought to add artichoke… must try it! WHY have I never done this before? I agree that chicken marsala is all about the mushrooms, but adding artichokes? Oh dear goodness, I haven’t tasted it but I think I have died of bliss. YUM! I can’t wait to try this – and soon I hope! 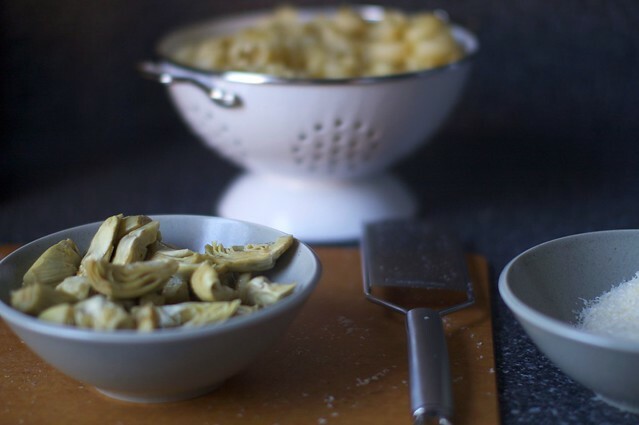 A favorite pasta shape and veg in the same pot! Thanks – AGAIN! Hi Deb – your “assembled during naptimes” quote is cracking me up. I went through all of this 2 years ago almost exactly – which is why I write about it now. Cooking at home certainly gets more efficient with the baby in the house!! Thanks for the Marsala substitutions. Also, I am missing your pictures but glad we can print on 1 page. I made this tonight- it was amaaaazing!!! Thank you so much for posting this. I usually don’t like Giada (she’s cloying to me), but wow- good job girl. I made a couple minor changes- I added a little garlic and a bundle of thyme during the onion step (only because I love those ingredients with mushrooms), and the lemon juice you suggested (totally loved it). I also turned it into a casserole by broiling it with panko, melted butter and parmesan on top for 10 minutes. The added crunch-factor was great! What a fab recipe. Just made it tonight as a quick supper. I love how fast it pulled together and how rich it tasted. Perfect for a vegetarian like me. My hubby just fried up some italian sausage on the side and added it to his bowl. Perfect dinner. Thank you! We made it tonight – the only changes I would make in the future would be to add 2 splashes of balsamic vinegar and not to let the wine reduce so much. But I like saucy pasta. And, it will be made again in the future because it was delicious and easy. Oh my, this is perfect. I’m making dinner for my new BF at his place for his Christmas gift and I’ve been desperately searching for a recipe that is fairly easy (cooking in a foreign environment can be so unpredictable) but also moderately impressive. Thanks Deb!! I made this last night and it was lovely. I can see why you might want to add some lemon, but had it without and it was fine. I skipped the artichokes, just didn’t want to spend the $$ last night, and added some spinach that I already had in my fridge instead.. I could have used more sauce, I may increase it the next time. Overall – a very comfy winter meal. Thank you!!! I will be making this one soon! 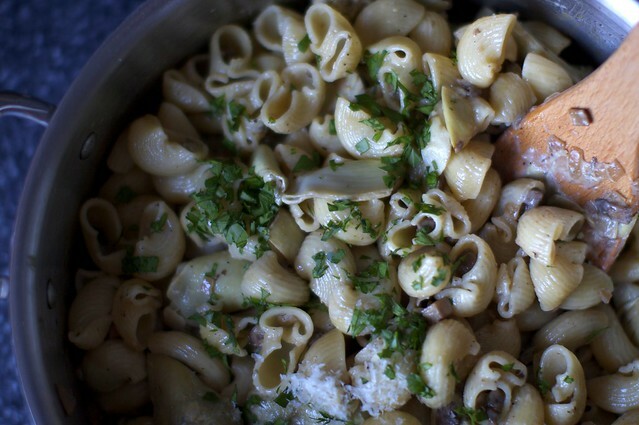 Mushrooms, marsala, cheese, artichokes, herbs, pasta…. what more can anyone ask for? It’s the perfect comfort meal. Must try this recipe soon! I’ll just splurge on a big jar of artichokes at Costco, haha! Now that I made it, it was as awesome as it sounded. Thank you! I made this for dinner last night using Barilla pipette pasta (they look just like the snails in your picture!) It was absolutely delicious with the splash of lemon added at the end, but a little dry. Did I leave it on the stovetop too long? Any other suggestions? I made this last night for two of my vegetarian friends- both of whom hadn’t had marsala anything in so long because it’s usually with chicken! They loved it. I ended up having to use canned artichokes (my Whole Foods didn’t have any frozen artichokes, and we have no Trader Joe’s where I live :( ), but it tasted just fine! I made your Vanilla Roasted Pears for dessert over ice cream and they were delicious!! After my friends left, I sat down with the newest Oprah magazine- to see a blurb about this blog! Congrats on that, and thanks for the great recipes! I made this Christmas eve for my husband, who loves mushrooms and artichokes and it was great. We both thought the artichokes were unnecessary and overpowered the mushroom taste a bit too much, though, so we might omit them next time (that might have also been because I couldn’t find frozen artichokes at Whole Foods and bottled instead, although I rinsed them well). I might also double the sauce liquids next time as someone else mentioned above, as it was a bit dry. Definitely a keeper, though! 1. I had some good bacon on hand, so instead of olive oil I started by making lardons–scooped the fried bacon bits out, used the rendered fat to saute the onion, and sprinkled the bacon back on at the end. I recommend this highly for non-vegetarians. 2. I also thought it could have been saucier–next time I won’t reduce the Marsala so much. 3. Finally, I’m thinking of swapping out some of the cream for beef stock or adding some tomato paste or something–somehow I wanted something *more*, more flavor and depth than what I wound up with–though I really enjoyed eating it and will enjoy the leftovers too, I’m not sure if I would serve it to guests as is. 4. Maria (commenter 111)–huh, I had no trouble keeping the pasta hot–it was cooking in the simmering sauce until right before it hit the plate. But you might try heating your plates or bowls in the oven before you serve onto them. I have made this dish twice and I’m enjoying the leftovers for lunch as I type this. Thank you, Deb, for sharing your delicious recipes. I have been reading SmittenKitchen for about a year now, and I am continuously inspired by your posts. Thank you, thank you – and my husband thanks you as well. Keep up the great work! Very good! Personally, I tend to find that Giada oversalts and -peppers things, so I dialed the pepper back. She just casually throws some salt in when she’s making things on the show, but then she writes 1/2 tsp. in the recipe. Anyway, probably just a matter of taste. just like with the mushroom marsala chicken, i used merlot as a marsala substitute. i actually had to substitute a lot of things, but all in all, i’m excited for dinner tonight. I’m single and I rarely cook during the week. I also normally eat out of the pot I cooked in over the sick. Classy, I know. This dish was so freaking good that I actually broke out the good dishes and even poured myself a glass of wine to sip while I ate at the table like a proper person. I love this dish. oops, that’s sink not sick. I’ve been reading your blog for a while now and I’ve really liked everything I’ve made from it. This, however, takes the cake! It was easy, quick and very tasty! It will definitely become a standard in my house! Thanks so much for refreshing my dinner ideas whenever I need it most. I didn’t have any marsala so I substituted cooking sake (seeing as it’s a sweet alcohol). Absolutely delicious! I was surprised by the flavour, which was amazing. How do you make such constitently good food? great recipe! i’m eating it as I type. =) i, too, would not reduce the marsala so much, and would add 3/4 c cream, and maybe 1/2 cup chicken stock…either that or use as is with only a half pound of pasta. great flavor! My family loved this so much I made it twice in three days. Easy! I added chicken to the second batch. I suggest you start boiling your pasta water from the beginning so that the pasta is ready in time to add to the pan once the Marsala has almost evaporated. Yum! For those wondering about canned artichoke hearts, I have never seen frozen artichokes in the UK so just tried the canned ones (in water – not marinated antipasto ones). 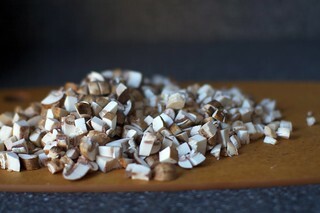 I rinsed them and then chopped them up a bit. It was delicious, and while it might have been better with frozen ones, canned were a good substitute in my opinion. I did everything else exactly as in the recipe. I just made it and it my roommate and I agree that it was AMAZING. I used canned artichoke hearts because the store didnt have frozen. 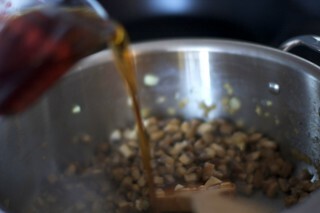 I also added the 1 tbsp of aged balsamic. I also drizzled it with white truffle oil at the end, which was AMAZING. Try orange juice as a drink, complements the meal so well surprisingly enough. I also subbed in Whole Wheat pasta instead of regular pasta, just to make it healthy. I may half the recipe though. Way too much. Another amazing recipe from smitten kitchen. I made this for dinner and it was DELICIOUS. Made this last night. Great flavors, should have taken your advice and added a touch of vinegar/lemon juice to brighten it up, but even without – great. I also didn’t add artichokes because I was having guests who are picky, but next time I will. Thanks again deb! Whipped this up for lunch today and it was a success! I don’t keep marsala on hand, usually extra dry vermouth, but in this instance I had neither and the dish was for my toddler daughters so chicken broth made an excellent substitution. My question is this: why did my sauce turn out watery? I used light cream for this recipe & added spinach. Did I not cook the cream long enough (or did I add it in at the wrong time or the wrong heat level)? Should I have added extra cheese to make up for the fact that I used light cream? awesome recipe! Very little time needed and tastes fantastic! :) Thank you very much. @Lena: Spinach contains a lot of water, so you probably need to make sure all that is gone before you add your cream (btw I used cremé fraîche which is thicker anyways). And if something is too watery you can always just let it simmer a bit longer or add some kind of sauce thickener. Do you think this recipe would freeze well? Absolutely delicious! Even my carnivore husband didn’t mind a vegetarian meal. Super easy but just as wonderful as if I’d slaved all day. Used whole wheat penne and it was still great. Thanks! Love your blog. Mmmm, this is the first thing I attempted to assemble after wandering out of a Newborn Baby Boot Camp daze. It was just what I needed! So easy and comforting and the whole thing only took fifteen minutes. My local supermarket didn’t have frozen artichoke hearts, so I used the marinated ones from a jar and just gave them a bit of a rinse. I also chopped them up in case I wound up eating with one hand while hanging onto the baby later (which I did, although I stayed fancy and used a fork instead of a giant spoon. I guess I’ll aim for fork-and-knife eating in a few more weeks). I also added a squirt of lemon juice. YUM. The whole thing made me feel human again. Adapted this recipe a bit further last night. Eliminated the artichokes. Only reduced the wine by half and upped the cream to a cup. Pureed the whole she-bang in the blender, then returned to pan and stirred in 1/2 cup pasta water, cheese, salt, pepper, and parsley. It’s not as pretty this way, but the mushroomy-ness works itself all the way into each piece of pasta (I used medium shells) moreso than with chopped mushrooms. Totally cozy and delicious. i just finished eating this :) loved it! 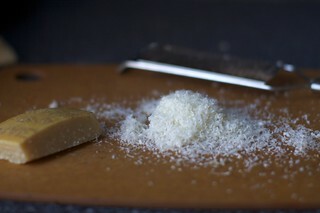 next time i’ll probably use half the amount of parmesan just to get more of the mushroom-cream taste in the sauce. easy and delicious! this one of those recipes that im literally licking the bowl after i finished eating. a must try for any mushroom lover! I love this recipe and have made it many times with *great* success. I’m wondering though- as an alternative to marsala (don’t get me wrong, I love the marsala flavor! )- if white wine could be substituted in for a different spin on the recipe? I’ve seen comments that people have tried everything from sake to port to merlot instead of marsala – but without alot of information on other adjustments in the recipe. Has anyone else tried white wine and if so- were any other changes needed to the recipe to balance out the different style of wine? Excellent post. I simply stumbled upon your website and wanted to state that I have truly appreciated exploring your website articles. Regardless I’m going to be registering to your give food to and that i we do hope you write again soon! another delicious recipe! i used non-dry marsala (i presume, as it didn’t say dry) because that’s all i could find. it was a little sweet, but once i added lemon juice it was so good! i think i’d add more artichoke next time because it really balances the rich, sweet mushrooms – i used canned artichokes (again all i could find). yum. One more thing before I forget: did you just remove the hearts from the artichokes or did you buy canned hearts? If you bought canned, any brand recommendations? Hi Liv — I don’t have a favorite brand of canned (I actually don’t see many on the shelves; usually just grab Progresso or whatever the store has) but I’m very, very, very fond of Trader Joe’s frozen artichoke hearts, if you have one near you. They’re utterly perfect and cook up wonderfully. Our three-year-old had fourths of this! He called it mac and cheese, which is very high praise. Some frozen peas were a welcome addition. Thanks! This paste looks delicious! and it is very easy to do, I will try to prepare it today. thanks!! This was delicious, I’ve also made it without the artichokes and whilst not quite as good, still made a tasty dinner. Thanks for the recipe. This sounds so good…I just got hungry reading it. I have to think that these foods seek their native wines. One of my favorite Italian whites is Arneis. It will do so well with this dish. I made this last weekend for a dinner with friends. but I wanted it to be a main dish so added chicken to it. I changed the pasta to penne partly because of the larger chicken chunks and partly because my store didn’t carry the types of pasta Deb mentioned. It was easy to make and really tasty. I will definitely make it again. Thanks for such tasty recipes! Now I think I’ll try her chicken marsala recipe. I made this tonight and it is positively delicious. However, I did make a change that was nice for fall. I’m not a fan of artichoke hearts, so I decided to add butternut squash instead (pre-cut from Trader Joe’s, fyi). I cooked it separately, added it to the mushrooms and onions, and then added the marsala to reduce. My three year old daughter and husband both loved it. And it was super easy. Thanks for the tip about frozen artichoke hearts at Trader Joe’s– you really can’t beat the price ($2.99 for 12 oz) and the recipe is absolutely delicious. I love the mushroom-artichoke-onion combination and the dish was the perfect way to warm up from a cold winter day! This is a great recipe. I make it often and I veganize it by making cashew cream and omitting the cheese in favour of some nutritional yeast. I also add a ton of garlic because, come on, garlic is amazing. thanks for sharing! Tried this today to get out of of a fast food slump. It turned out well considering I am living in a furnished apartment with not a lot of utensils! I made this recipe with the all-mushroom update for dinner last night for my parents and BF and we devoured it! Such a delicious and hearty pasta dish, and the flavors were complex and perfect. I didn’t have Marsala wine, so I subbed in 1 cup white grape juice and 4 tsp of brandy, it it was heavenly. I looked over this recipe to make it again, and a question came to mind: is everything (other than the pasta) cooked at Medium High the entire time? Do you reduce the heat to medium low or low when the cream is added in? Also: for anyone looking to “spiff” up the recipe, be sure to add in some capers to the sauce (which our family does whenever traditional chicken and mushroom Marsala is made). Yes, medium-high is a good temperature for a sauce like this. I’ve made this a bunch of times, and its great with or without the artichoke hearts. I just happen to have some artichoke hearts that need to be used up. Amazing! We made as written, excellent! Thanks! I can’t figure out how to save or download a recipe wo copying and pasting or emailing it to myself. Am I missing something? I make this for my family all the time…and I haven’t included the artichokes since the first time years ago. It’s even good with whole wheat pasta.